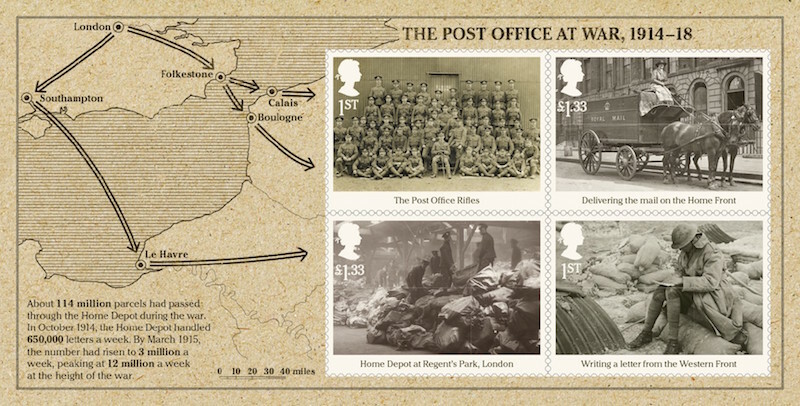 Some collectors will be disappointed, and some will be pleased that their pocket will not be raided on this occasion as Royal Mail's mid-way commemoration of the Great War is revealed. 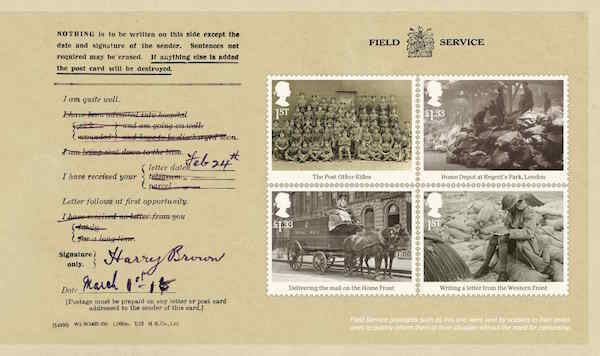 As usual there are six stamps and a prestige stamp book, but this year also a miniature sheet, marking the contribution of the Post Office Rifles. The stamps of the miniature sheet (above) are also included in the PSB (below), so there will be plenty of additions to the catalogue and pre-printed albums will have space for these. The national flag (and Northern Ireland's fields) get another run out, and the gummed definitive-sized poppy gets another airing which - depending on phosphor, shade, etc - may mean that this pane does not create any new stamps. Time will tell. Full detail of the designs, and pictures of the set of 6 can be found on our website. 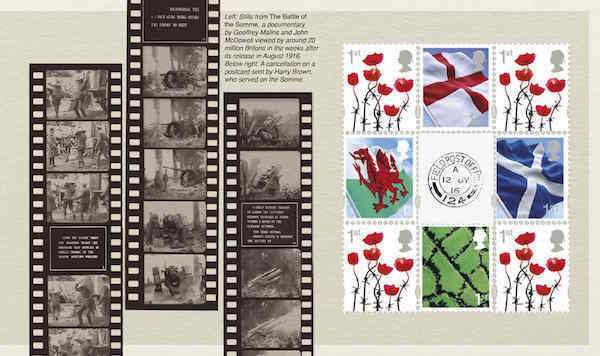 Special postmarks are in Royal Mail's Postmark Bulletin available for free download. I for one am very disappointed at no new Machin definitives the country stamps are getting really boring now . Very strange decision on the part of Royal Mail. They must know that the inclusion of Machins in PSBs increases interest and therefore sales in them, and yet instead of that they repeat country stamps again. I do also wonder how much of the proceeds from all these Poppy and Great War stamps are being donated to the relevant charity/charities. A cynic might say that any figure less than all of it means that Royal Mail are exploiting commemoration of the fallen during various wars for profit. Pretty much confirms that there aren't any stamp collectors on the stamp committee. A PSB without a Machin is going to reduce sales drastically as I know collectors who buy more than one book just to get a full set of horizontal and vertical Machin pairs. With 8x1st class stamps in the pane it will even increase the cost price. They've also only included the Northern Ireland 1st class regular country definitive making it even less attractive for collectors. Interesting. I was told by my local PO that all these stamps have been withdrawn from sale and were not allowed to sell them?? Any Ideas.